So you decided to take the bold step and start up an Uber business. Or perhaps you invested in purchasing a car for Uber, but you find the daily intricacies of managing your cars quite tricky, and you just want to conquer this and manage your cars properly and efficiently. Or maybe you haven’t even started – perhaps you are wondering what business path to tow next and Uber sounds like an attractive option but you want to dip a toe in the water and understand the mechanics of making money on the platform. Whatever the case may be, I have you covered. For those who are just joining class, Uber is a global taxi booking system that matches passengers and car owners willing to drive them, together based on their GPS co-ordinates. Passengers looking for a taxi just download the app and enter their destinations and the app helps find and book the closest taxi to them. The owners of the taxis used on the platform are called “owner partners”. Following a simple registration process, an owner partner can purchase vehicles, put these on Uber’s network and pick up passengers sent by Uber in exchange for a commission. In this article, I want to concentrate on the taxi businesses that are built around the platform. Since Uber increased their global presence, expanding to cities such as Lagos, Bali, Chennai and Durban, business opportunities have opened up in these cities almost overnight. Investors have been able to make steady returns by purchasing compliant vehicles and putting them on the Uber network in partnership with drivers looking for vehicles to drive. Some investors purchase cars and offer them through a rental program to drivers who want a quick start on the network. Others prefer to offer a longer term hire-purchase agreement in which the driver pays for the car in installments while using the car to work. Both streams are quite profitable and attractive and these business models are covered in a separate post. Unfortunately, anyone who has managed an Uber vehicle or driver can probably attest to how difficult and draining the process can be. Keeping a tight eye on expenses, selecting the most lucrative spots to pick up passengers etc. 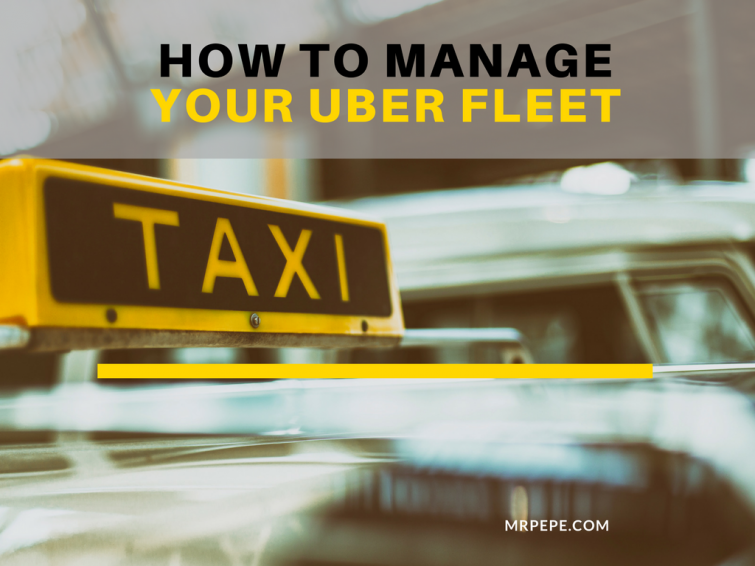 So I decided to write this to help outline ways to help you manage your Uber business. What kind of car specifically you need to purchase in order to make your investment back quickly, and also one which would not depreciate by too much in the long run. Cost analysis. This is a calculation of all the costs you intend to incur from setting up this business and against the benefits that you anticipate from it. This would help you set a realistic outlay of how much you need to get going, and also gives you a rough idea of how the business should expect to turn out if everything stays as it is. In most businesses, the first year costs are usually the highest while the business is being set up (in this case, the vehicle purchase brings the cost up) and in subsequent years, you can expect lower costs (insurance, maintenance etc) and higher returns on your investment. Here is an example of this from Uberkit’s business package. This outlines the costs and expected profit in Year 1 for a model in a model where the investor hires a driver and pays him/her a salary. In this example, he adds up all the costs associated with the business – Vehicle Acquisition, Maintenance costs, Payments to Uber, Driver’s Salary, Petrol etc on an annual basis as well as a weekly and monthly basis. Break-even analysis. A break-even analysis helps you identify when your business would be able to cover all its expenses and start making a profit. For example, if you purchased your car for N1.5m, and offer it to an owner-driver on a hire-purchase contract paying N40,000 weekly, you might find out that your breakeven point is 37.5 weeks. This means that after 37.5 weeks, everything you make is a profit. For a driver, this needs to be calculated differently, you will need to add the total cost of purchasing the car, to the cost of insurance, weekly petrol, car maintenance/repairs etc so it might take longer to break even but this is normal in this business. Usually, you achieve positive cash flows in Year 2, 3 etc once you have offset the hefty cost of purchasing the vehicle. What risks you might face with this business and explore potential solutions you can deploy so that you have an action plan beforehand. This ensures that if anything happens that is not as expected, you have an action plan to take care of it. I find that Uberkit’s business package saves me a lot of time as I don’t have to populate these spreadsheets from scratch. Not just that, but the spreadsheets are prepopulated with formulas, so I just need to enter my numbers and it calculates my key metrics for me. This helps me spend 5 minutes (instead of 5 hours!) checking whether I can turn a profit after purchasing a vehicle, paying petrol/maintenance costs and paying a driver. Moreso, the kit only costs $47 – much less than i could hire someone to help me with this for! (Plus the friendly staff are there to help with any issues I have had). After investing a vehicle on the network, the first thing you need to do is find a reliable and trustworthy partner to work with. In fact, there is nothing wrong in you starting to look for a partner before you actually put money down for a vehicle. To find a partner, you can attend one of the many partner matching sessions which Uber puts on for its partners to link drivers to vehicle owners. Alternatively, send me an e-mail and I can put a request out on your behalf (free). Once you have found a partner, you need to draw up an agreement with them detailing the terms of the partnership. For this, you need a fully fledged agreement on paper which needs to be signed and agreed by both parties before the partnership can commence. This is legally binding and should help you in the unlikely event that something goes wrong in relations between you and your driver. Again, an editable sample is included in Uberkit’s package. A daily log helps keep your driver accountable on a day-to-day basis. They can fill it as they go about their jobs and take a photo and send to you at the end of each working day. This essentially acts as a tracking tool to identify on a daily basis how the business is running. What this does is that if you are not meeting your targets to break even you predicted, you can quickly identify this and correct it before it turns into a catastrophe. For example, if you as a driver previously calculated that you need to make N60,000 weekly to pay off the cost of your car and expenses and you have only made N50,000 2 weeks in a row, you know that you are off target by N20,000 and need to make up the deficit somehow. This might make you work extra days on Uber or book airport runs to supplement your income. Here’s an example of the driver log offered by UberKit. So there are the basic steps involved. I hope that this writeup has been helpful to you, and if you do have any questions, I’m always here to help. Drop me an e-mail or a comment in the comment section! Thanks a great deal for the article! You’ re wonderful!! Hi Ethan, Thanks a great deal for this instructive write up. I wish to take this business but have been researching before i came across yours. Could you kindly share your email address as well as Phone number as i need to get some of the kit and pick your brain on some grey areas? Thanks for the article? I’m struggling with how to structure an agreement with a driver. I understand the weekly lease payments, but how do I also incentivize the driver to pickup private rides that I arrange? What other aspects of the agreement are common? How can I make more money based on the drivers success beyond the lease payments? Thanks! I have to voice my love for your kindness in support of men who need assistance with this issue. Your real dedication to passing the message all around became definitely invaluable and have without exception empowered professionals like me to arrive at their ambitions. Your entire warm and helpful report can mean so much a person like me and extremely more to my colleagues. With thanks; from each one of us.